The Museum of Scotland is a striking and impressive achievement, beautifully framed by its surroundings, by Edinburgh's Old and New Towns, and the landscape beyond. From the Museum's roof-top garden visitors will have an unrivalled view of the historical as well as architectural context of the new building. Edinburgh Castle , Greyfriars Kirk, the Scott Monument , the spires and pinnacles of the city, the sea, and the hills beyond interact with the new museum, reinforcing its role as a central point in the nation's heritage, a protector of Scotland 's treasures. 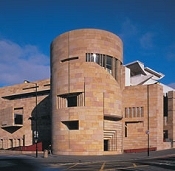 In 1991 architects Benson + Forsyth were selected as winners of the architectural competition to design the new Museum of Scotland . We currently have 664 Hotels near Museum of Scotland with prices starting from £7 per night. For more information on how use this page please read the following paragraphs. Ratings for quality and value are currently held by many of the Hotels near Museum of Scotland, which means that you can rest assured that great attention is being paid to the provision of good standards of accommodation, as well as a warm welcome. You will find genuine value for money is offered by the wide range of Hotels near Museum of Scotland. In order that our visitors have peace of mind, many of the Hotels near Museum of Scotland have secure on-line booking facilities, so that you can arrange your visit easily, at the touch of a button. In order to protect your privacy on-line, all bookings are made through a secure server, which provides total protection for your personal data. On these links you will find a colour photo of your chosen Hotels near Museum of Scotland, along with a basic price for your room stay. Make your choice from the list, and then, for up to date room rates, search the dates by using the calendar. Many of the Hotels near Museum of Scotland have links to their own website, which gives you ample opportunity to see for yourself the value and quality on offer from Hotels near Museum of Scotland. You can use the Google “zoom-able” map to explore the area and landmarks surrounding your chosen Hotels near Museum of Scotland. * This is the straight-line distance to Museum of Scotland centre. Actual travel distance may vary.